Agriculture is the science, or practice, of cultivating soil, producing crops, and raising livestock. Career options go beyond farming and ranching and can be divided into many various categories and directions. Whether you work directly with the animals and resources that contribute to the worldwide food supply or take a more distant position, if the idea intrigues you, then one of the many roles in agriculture could be an excellent fit. As you can see from the diversity of the workplaces above, there are quite a few different paths to take. Careers look similar to what you would find in the world of business. Do sales, marketing, or finance, just with a focus on agriculture, or work with loans and insurance for farms and equipment manufacturers. Many of these career choices only need an associate or a bachelor degree. Salaries range from the $60Ks through well into the $100Ks. Choose one of our many agribusiness programs. Associate degree options: You will take courses leading up to an associate of applied science, associate of arts, or associate of applied arts and science. All of these can transfer to a four-year university, where you’ll be able to get a bachelor’s degree. Bachelor degree options: Programs like agricultural business and agricultural business management will be well suited for your agricultural path. Work with seed manufacturers, find ways to lower greenhouse gas emissions, design more efficient barns, or even figure out better ways to deal with animal poop: Most of the agricultural technology, tools, systems, and supplies are developed and produced by agricultural engineers. A bachelor’s degree is the minimum educational requirement for this career, and you’ll want it in agricultural or biological engineering to easily find employment. Median salary is above $74K. Get your bachelor’s degree: Get your bachelor’s degree in either agriculture or biology engineering. Internship: Obtain an internship in the industry to gain experience. You’ll find many open positions on popular online job boards. License: Get your required professional engineering state license through the National Council of Examiners For Engineering and Surveying (NCEES). Certification: Get your general engineering technology certification through the National Institute for Certification in Engineering Technologies (NICET). Experience: Get as much career experience as you can manage. Ask to be a part of projects outside of your comfort zone, and find a mentor at work. Advance: Between your certifications and your accumulating experience, you can find major advancement in the industry. Locate an agricultural engineering program near you. This career merges journalism with the agriculture industry. 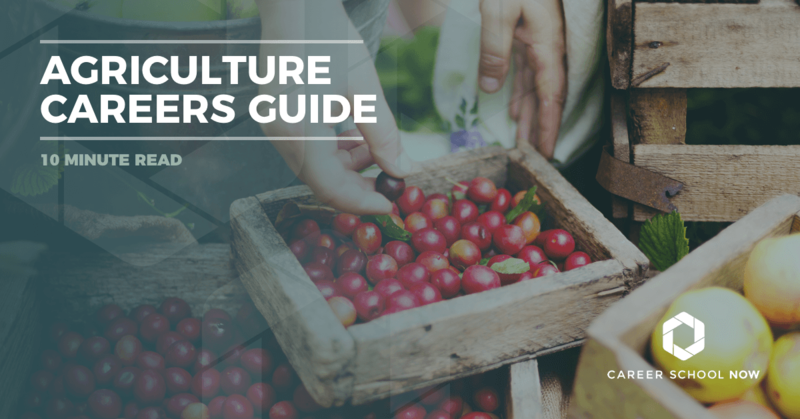 Food safety, sustainability, and trade policy are just some of the topics an agricultural journalist or agricultural information specialist covers. Write about new developments and technology, pass on information about fairs and livestock shows, or discuss current weather events or patterns. Average salary is $38K. With a background in agriculture journalism, you can also start a PR career, work in marketing and advertising, or clock in as a reporter. Degree: Most agricultural journalists earn bachelor’s degrees in either agricultural journalism or communications. You’ll take writing and editing courses as well as classes in animal science and economics. Experience: Get some hands-on experience through an agriculture magazine or your school’s newspaper. Organizations: Join professional organizations: the International Federation of Agricultural Journalists, the National Association of Farm Broadcasters, and the American Agricultural Editors’ Association. These help set industry standards and give you opportunities to network and improve. Job: Find a job with journals, online magazines, public relations firms, or the government—either local, state, or national. Continuing Education: Although not common, you can get a master’s degree in agricultural communications, especially if you want to teach or do research. As an agricultural technician, you’ll work on a farm where you’ll do experiments and research for optimal plant and crop growth and production—identify and find ways to treat insects and weeds, examine the soil, and set up the supply of vaccines for animals. You’re a sort of middleman, with other employees reporting to you, but you’ll report to a farm manager. Average salary is over $39K. Before college: If you’re still in high school, load up on all the science and math classes you can take. College: Get an associate degree in biology, chemistry, crop science, animal science, or another related science. Training: Or, instead of a degree, you can get on-the-job training with a high school diploma or GED. Specialize: Which sector of the industry you enter will determine the type of additional training you may need. Advanced degree: Think about getting your bachelor’s degree in agriculture or other related sciences. Different agriculture programs convenient to you. You’ll work with domestic farm animals conducting research for universities, private companies like animal production facilities, or the government. Analyze animal genetics, nutrition, reproduction, growth, and more. You might even crossbreed animals, address pet obesity, and study zoo animals. Training in animal biology, biochemistry, and physiology will help make you qualified for this career. Average salary is over $60K. College: You’ll need a bachelor’s degree in a field like animal science. Internship: Get an internship to gain hands-on experience. Add some humanities courses into your class load. Effective communication is important in the field. Advance degree: If you’re going to want to focus on research, you’ll have to get a Doctor of Philosophy (Ph.D.) degree in animal science. To be competitive in the field, a master’s degree or Ph.D is recommended. Organizations: Join a grad student association, where you’ll have more educational opportunities. Certification: This is a necessary step, and there are a few options. American Registry of Professional Animal Scientists’ (ARPAS) Associate Member Professional Animal Scientist (PAS) certification is for those with at least a bachelor’s degree. If you have a master’s or doctorate, there are even higher level certifications available. An animal science program may be available near you! The main difference between a farmer and a rancher is a matter of what they choose to raise. Ranchers raise all types of livestock, and farmers grow produce but may also have horses, chickens, pigs, and cows. Farmers may use their cows for milk, while ranchers sell their cows for meat. As either, you need to like being up early, toiling in any sort of weather, and working until sundown—especially in the early years and crucial seasons. The average salary for farmers and ranchers is $69K. There is no required degree, but it is highly recommended to get a formal education so you have some veterinary, repair, and financial skills ready at hand. At the very least, get your high school diploma or GED. Get as much experience as you can while you’re in high school. Get an associate degree or become a rancher apprentice. If you have a bachelor’s degree or at least four years of experience, you can get your certification. This will allow you room for more career advancement. If you weren’t born into a farming family, you’ll first need to finish high school and have some farming experience through training. You’ll be doing the grunt work at first, but you will move up to better tasks in time. Get an associate or bachelor’s degree in agricultural economics, farm management, agriculture, or dairy science. Certificate programs may also be available—perfect for those who already have years of farming experience. Find an internship to get more experience. Get your Accredited Farm Manager certified through the American Society of Farm Managers and Rural Appraisers if you have a bachelor’s degree and four years of experience. Constantly improve your skills with continuing education. Farm managers are the head farmers, in charge of overseeing all the daily operation going-ons, inspecting the crops and animals, and running the machinery. At large farms, you will mostly do administration tasks such as the hiring and firing of the employees. The average salary is over $69K. Degree: Get a bachelor’s degree in agribusiness or farm management. Experience: Work in an entry level position such as an assistant manager or management trainee. Advance: Receive a promotion to farm manager. Certification: Get your Accredited Farm Manager certification to help with your employment advancement. Continuing Education: Keep on learning through continuing ed. Farming processes and technologies are always changing, so it’s best to keep up with all the advancements. Courses are available in farm planning, leadership and research skills—even renewable energy. Create gorgeous and decorative arrangements using flowers and greenery to bring a smile to someone’s face. Design for happy events like weddings and anniversaries, and commemorate loved ones with more solemn arrangements. One in five florists are self employed, and if you end up running your own business, you will need to handle all the ordering, marketing, and organizational tasks as well. The average salary is over $26K. Education: You’ll need your high school diploma or GED for an entry level position. If your goal is to have your own shop, then you’ll probably want to get an associate or a bachelor’s degree. Floral design: You can take courses in floral design, caring for flowers, flower and plant identification, advertising, and concepts through private floral programs or community colleges. College: Some community colleges offer certificates or associate degrees in floristry operations and management. Training: Getting a job with a florist or floral designer and training under them is always a great and highly recommended plan of action. Certifications: Certifications are voluntary. You can get a Certified Floral Designer through the American Institute of Floral Designers (AIFD). As a food scientist, you study foods. Essentially, you’ll develop new foods and relevant packaging, and conduct studies and tests on shelf life, chemicals, and other important factors related to the foods we eat. Help make processed foods healthier, or enforce regulations to make sure items people buy are safe. Earn an average of $63K annually. College: You’ll graduate high school and attend a four-year college to get your bachelor’s of science in food science. Intern: Obtain an internship in the industry, either with a government agency, food processing and packaging firm, or other companies your school may have on their roster. Advanced degree: Get a master’s degree if you want to get into the research aspect of the career. Specialize: Decide which career path you’re going to head down: packaging, research, or manufacturing. Certification: Get Certified Culinary Scientist certified through the Research Chefs Association. Additional certifications: Another certification to think about is the Hazard Analysis Critical Control Point Auditor (HACCP) from the American Society for Quality. This is a standard from the Food and Drug Administration. If becoming a food scientist is fascinating to you, learn more here. Work for a university or business maintaining its onsite greenhouse. You’ll nurture and grow the plants and crops. Manage the irrigation and climate controls, and collect and compile data for your employer. Greenhouse techs earn an average of $36K per year. Degree: Get an associate degree in horticulture, plant science, or another related field. Experience: Gain experience while you’re still in school through an internship or job at a local nursery. Certification: Some states require greenhouse techs to be certified if they are using pesticides. Skills: Computer and communication skills are a plus. Advanced degree: Consider getting your bachelor’s or master’s in the greenhouse industry to move up the career ladder. Because you’ll have a full arsenal of plant knowledge, from the physiology through breeding, you’ll work in landscape design, care and production, or growing and selling of crops. You’ll find jobs teaching and researching if you have a master’s degree. Your average salary will come in just under $63K. Degree: You will start with a bachelor’s degree in botany or horticulture. Internship: Get into an internship program to gain skills. Job: After graduation, find a job with a landscape company, university, or government research program. License: Most states require licensing. Check with your school and state to see what’s required for you. Certification: Get a certification to open up more doors. Soil Science Society of America offers several levels of certifications, and passing the Certified Crop Adviser exam from the American Society of Agronomy shows others your commitment to the industry. As a landscaper, you’ll maintain the outdoor space of residential and commercial properties. Depending on where you live, your outdoor work may be seasonal, but your downtime will be dedicated to maintaining equipment, marketing your services, and ordering and planning. According to Payscale.com, landscapers can expect to earn $20/hour on average. BLS states that you can earn over $52K per year. Owners can earn more than $90K. Degree: Earning a certificate or associate degree in landscape technology or ornamental horticulture takes approximately two years. Career Options: With a certificate or associate degree, there are many job options open to you—landscaper, groundskeeper, horticulture specialist, golf course superintendent, and more. Experience: Find an internship or fieldwork, something that will give you the proper experience to prepare you for a job in your industry. Certification: Optional certifications for landscapers to consider through the National Association of Landscape Professionals (NALP) are Landscape Industry Certified Technician and Landscape Industry Certified Manager. Rodents, roaches, termites, and other infestations happen. You’re the one who will diagnose the problem and eliminate the pesky critters by using a variety of chemicals and traps. Specialize in a certain insect or animal, or train to take care of them all. Median salary for pest control techs is just over $34K annually. Diploma: You’ll need your high school diploma or GED before working as a pest control technician. Training: There is a formal training process that takes approximately three months. You’ll sit under instruction and get on-the-job training. License, registration, and certification: Most states require pest control workers to have a license. There may be additional registration and certifications depending on which state you’re in. Advancement: As you gain more experience, you can climb the company ranks. Career opportunities may include becoming a supervisor up to company owner. These career choices are just a smattering of what is open to you if you choose the agricultural route. If working with animals, plants, and other resources relevant to life is equivalent to the air you breathe, then agriculture careers are perfect for you.